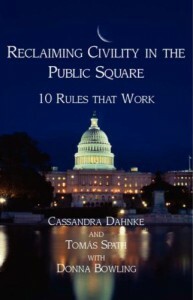 Institute co-founders Cassandra Dahnke and Tomas Spath will appear on Coffee Party USA‘s Internet Radio channel on Tuesday night to talk about the Institute’s book, Reclaiming Civility in the Public Square – 10 Rules That Work, and take live questions. The show is hosted through BlogTalkRadio.com, and is part of the February iteration of the Coffee Party’s monthly book club. Listeners to the program will be able to call in directly to speak with the show’s hosts, or chat live through the BlogTalkRadio website. Coffee Party USA is an organization that holds many values in common with the Institute. They are a non-partisan, grassroots organization with the goals of promoting cultural changes to address political disengagement and ideological polarization, and encouraging inclusive, civil, fact-based, solution-oriented dialogue about pressing policy issues. If you want to listen, you can tune in here at 8:30pm EST on Tuesday, February 24. The phone number to call to ask a question is (646) 929-2495. Or you can ask questions online through the same page. But you must register for a free BlogTalkRadio account, first. Update: In case you missed Coffee Party USA’s chat about Reclaiming Civility in the Public Square, you can catch the whole thing here. Tune it. It’s interesting stuff.